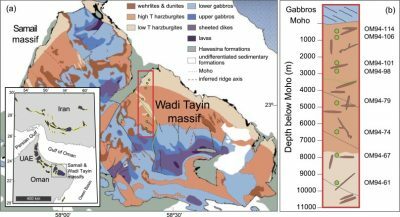 A geologic map of the Wadi Tayin massif, Samail ophiolite, modified from Hanghøj et al. (2010), and Nicolas et al. (2001). By examining the cooling rate of rocks that formed more than 10 miles beneath the Earth’s surface, scientists led by The University of Texas at Austin Jackson School of Geosciences have found that water probably penetrates deep into the crust and upper mantle at mid-ocean spreading zones, the places where new crust is made. The finding adds evidence to one side of a long-standing debate on how magma from the Earth’s mantle cools to form the lower layers of crust. 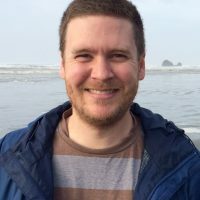 Nick Dygert, a postdoctoral fellow in the Jackson School’s Department of Geological Sciences, led the research which was published in May in the print edition of Earth and Planetary Science Letters. Collaborators include Peter Kelemen of Colombia University and Yan Liang of Brown University. The mantle section researched in the study came from ophiolite section in Oman. This image depicts a similar ophiolite section from the Bay of Islands in Newfoundland. Nick Dygert. The Earth’s mantle is a semi-solid layer that separates the planet’s crust from the core. Dygert said that while it’s well known that magma upwelling from the mantle at mid-ocean spreading zones creates new crust, there are many questions on how the process works. To learn more about the conditions under which magma turns into crustal rock, Dygert and his collaborators examined rock samples that were part of the Earth’s mantle a hundred million years ago, but are now part of a canyon in Oman. The team used “geothermometers”—the name of a technique that uses mineral compositions inside rock samples to calculate temperatures and reveal the cooling history of the rock. 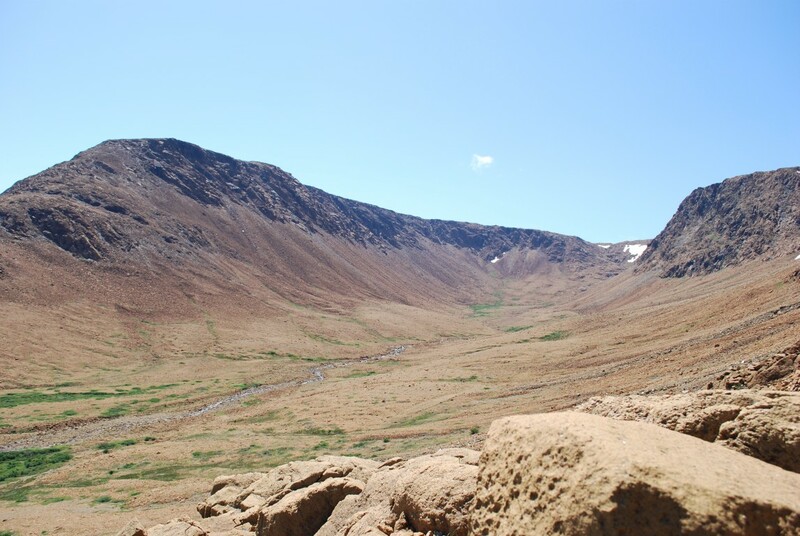 Geothermometers help scientists determine the temperatures experienced by magmas and rocks as they cool, and infer how rapidly the cooling occurred. The study included use of a new geothermometer developed by Liang, which records the maximum temperature a rock attained before it cooled. 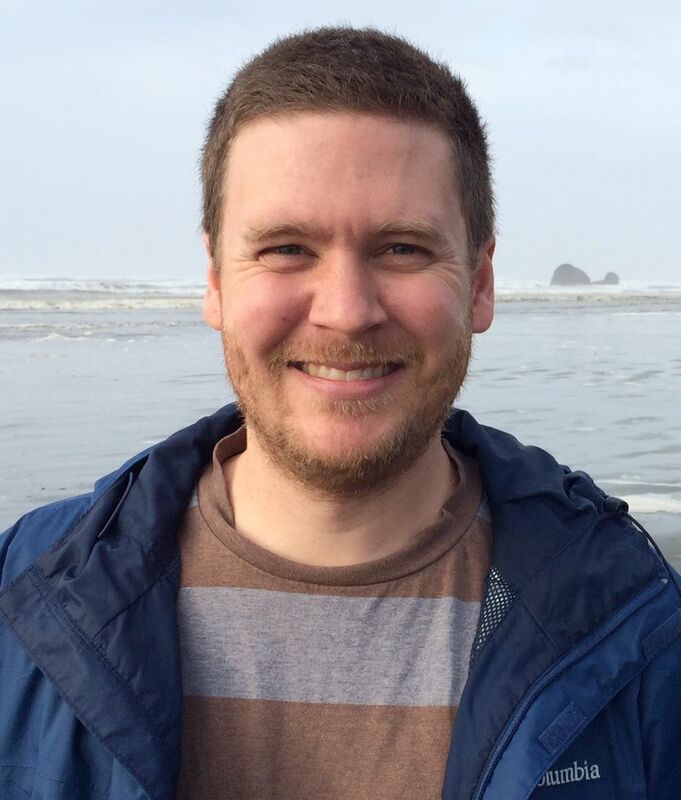 Nick Dygert is a postdoctoral fellow at the Jackson School of Geosciences. The temperatures recorded in the rocks show that the lower crust and uppermost mantle cooled and solidified almost instantly, Dygert said—like a “hot frying pan being plopped in a sink of water”—while the deeper mantle cooled more gradually. The temperature change is indicative of water circulating through the crust and uppermost mantle beneath mid-ocean spreading centers, and the heat from deeper portions of the mantle being dissipated through contact with the cooler upper rocks. Currently, there are two primary theories for crust formation. 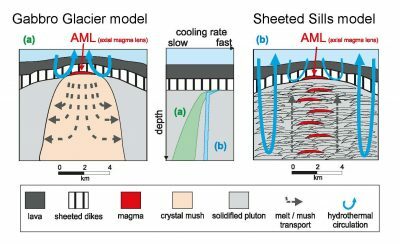 In the Sheeted Sill hypothesis, circulating seawater cools many small magma deposits at different depths in the lower crust, which would simultaneously cool the upper mantle. In the Gabbro Glacier hypothesis, magma gradually loses heat as it flows away from a central magma chamber. Dygert said that temperatures recorded by the geothermometers matched with the Sheeted Sill cooling process. 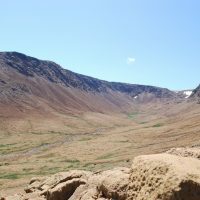 Uncovering how crust forms is at the heart of understanding the geological history of our planet, Dygert said, but the results could also have implications for our planet’s future. Some scientists have proposed mixing carbon dioxide (CO2) with water and injecting it into mantle rock as a means to fight climate change. The CO2 reacts with minerals in the mantle, which safely locks up the carbon up in their crystal structures. However, Dygert notes that mantle rock that has already been exposed to seawater may not react as readily with CO2, which would slow the carbon capture process. Dygert said that the new results suggest that circulation of water beneath mid-ocean ridges is effectively limited to the crustal section, and that enormous sections of the mantle could be available beneath the oceanic crust to efficiently trap CO2. The research was supported by the Jackson School of Geosciences, the National Science Foundation, the Alfred P. Sloan Foundation, and an International Continental Drilling Program grant.